But who will you get to be transtectors for the displaced Nitro and Cogman heads?! But yeah, wow, that is one well-armed and chunky robot that folds up into one clean plane. Fantastic! I mentioned the head gimmick and my son has decided he wants a Nitro Zues now to be a body for his Titan Master Apeface. -ZacWilliam, so I guess I'll be applying some purple paint. I plan on getting a few Nitros and Cogmen to use as Decepticon and Autobot transtectors for the body-less TMs. It occurs to me that Nitro could also pass pretty well for a member of the People's Liberation Army Mecha Force. Just needs a red redeco - or headcanon that the gray is a super prototype, or something. Optimus Prime keeps them. For his...collection. EDIT: ... whose Hasbro product code number and UPC barcode are way higher than those for any other figure in the line, so it's not like this is a missing wave 3 figure or anything. More like "the first wave 4 figure" kind of deal there. I actually wonder if Hasbro will just roll "Premiere Edition" as a recurrent "movie Black series" rather than actually END it in January. Especially with new Transformers films due next year AND the year after. If it's WW2 Bumblebee, drop in a couple retools for a dragon knight and Decepticon, and it'd be a solid wave 4 to carry into spring before Bumblebee Movie Premiere toys are slated to hit. If nothing else, it will give ample time for retailers to sell off older inventory. That's largely how they've handled Star Wars Black since 2015. Hmm. Depending on size, Nitro's head would be almost perfect for a custom I want to try. Which means I'll need a new head for him. The curvy and pointy look of that body really could make for someone like Thunderwing. Edited by NotVeryKnightly, 30 June 2017 - 10:38 PM. Edited by unluckiness, 30 June 2017 - 10:48 PM. YES! Somebody finally did this! ...This toy is going to be IMPOSSIBLE to find, isn't it? We'll see. I don't recall extreme issue finding any of the AoE deluxe and Voyager figures, but I do recall them hitting later than expected (didn't see wave 3 until well into the fall, despite the late summer release). I think some need to remember the movie only JUST came out...and we're stuck with this line up through Christmas, at least. 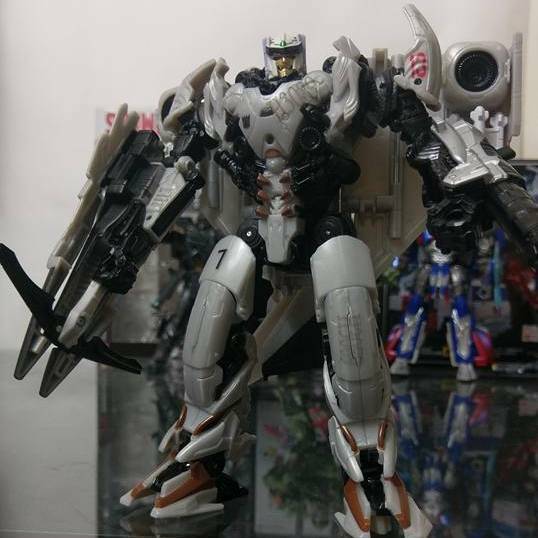 People want him for troopbuilding, for Thunderwing, because he was a fairly memorable Con from the movie, and because he simply looks good. And he's in the third (last?) wave, meaning you have to hope people payed the inflated price and cleared out all those Grimlocks and Optimuses first. I mean, I'm fairly hopeful I'll find him in stores, but I'm sure it'll be one of those cases where he appears for one week then he's gone forever. Gots to have me Steelbane and those weapons. Decent price too, all things considered. Man, that Steelbane does look good. It's a shame he's packaged with Pretty Okay Prime and Garbagebee! Well then. No need to sell the Thunderwing Titan Master from the box set, I guess. Sorry, Tidal Wave. They also have a listing for Scorn, but it has photos of Hound instead. Meanwhile, there's a listing for Voyager Scorn which has the correct photos but is named "Generations Titans Return Voyager Blitzwing and Hazard" instead (despite there already been a proper listing for Blitzwing). Edited by Nevermore, 02 July 2017 - 03:11 PM. Doesn't look like Hasbro stock photos, more like actual in-hand photos by Distribuidora de Brinquedos Hobby themselves. Also from Distribuidora de Brinquedos Hobby: The Autobot Sqweeks Voice Changer Mask. Stock photos for the Megatron and Bumblebee masks (which are presumably wave 1 of the assortment) have previously been seen via Toys"R"Us UK, whereas the Sqweeks mask (which presumably debuts in wave 2) was previously only glimpsed at Toy Fair. Edited by Nevermore, 02 July 2017 - 04:45 PM. I got Skullitron today and he required massive help in order to not be a floppy mess. Every ball joint was a disaster. I have fixed him, but that's another cofirmed to be a loose goose.